What If Nations Were Less Dependent on One Another? Autarky is more than a ten-dollar word for self-sufficiency, as it implies a number of questions that “self-sufficiency” alone might not. The ability to survive without trade or aid from other nations, for example, is not the same as the ability to reap enormous profits or grow one’s economy without trade with other nations. In other words, 'self-sufficiency' in terms of survival does not necessarily imply prosperity, but it does imply freedom of action without dependency on foreign approval, capital, resources, and expertise. Freedom of action provided by independence/autarky also implies a pivotal reduction in vulnerability to foreign control of the cost and/or availability of essentials such as food and energy, and the resulting power of providers to blackmail or influence national priorities and policies. Where self-sufficiency might suggest a binary state – you’re either self-sufficient or you’re not – autarky invites an exploration of which parts of one’s economy and political order are self-sufficient and which ones are critically dependent on foreign approval, capital, resources, and expertise. In terms of military freedom of action, some nations are able to commit military forces and project power without the aid or approval of other nations. These nations have military autarky, though they might be entirely dependent on foreign countries for critical resources, capital, expertise, etc. In this case, though their military may be self-sufficient in terms of capabilities (power projection, control of airspace, etc. ), any dependency in other critical areas introduces an element of political, financial, or resource vulnerability should the key suppliers disapprove of a military action. These vulnerabilities impose often-ambiguous but nonetheless very real limits on freedom of action. The key take-away from this brief overview is that autarky has two distinct states. One is absolute: i.e., Can a nation grow, process, and distribute enough food to feed its population if trade with other nations ceased?, and the other is relative: Is the we-can-feed-ourselves self-sufficiency of the subsistence-survival variety that requires great sacrifice and a drastic re-ordering of national priorities and capital? Or is it relatively painless in terms of national sacrifices and priorities? Clearly, relative autarky invokes a series of trade-offs: Is the freedom of action and reduction in vulnerability gained by increasing autarky worth a national re-ordering of values, priorities, and capital, and quite possibly broad-based, long-term sacrifices? There is an additional issue raised by autarky: Is the self-sufficiency a matter of being blessed with abundant resources, or is it the result of conscious national policy and resolve? Consider petroleum/fossil fuels as an example. Nations blessed with large reserves of fossil fuels are self-sufficient in terms of their own consumption, but the value of their resources on the international market generally leads to dependence on exports of oil/gas to fund the government, political elites, and general welfare. 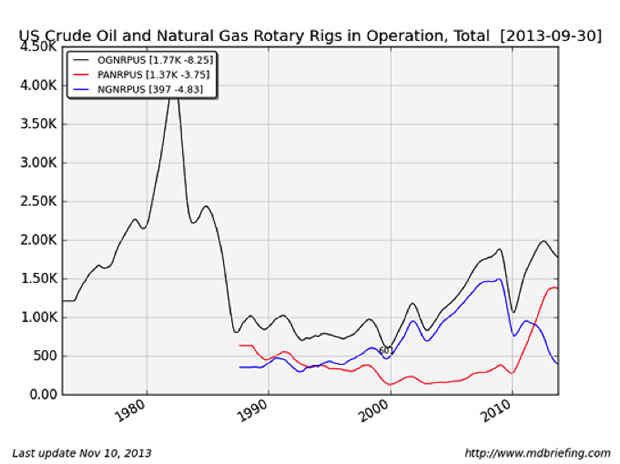 This dependence on the revenues derived from exporting oil/gas leads to what is known as the resource curse: The rest of the oil-exporting nation’s economy withers as capital and political favoritism concentrate on the revenues of exporting oil, and this distortion of the political order leads to cronyism, corruption, and misallocation of national wealth on a scale so vast that nations suffering from an abundance of marketable resources often decline into poverty and instability. The other path to autarky is selecting and funding policies designed to directly increase self-sufficiency. One example might be Germany’s pursuit of alternative energy via state policies such as subsidies. That policy-driven autarky requires trade-offs is apparent in Germany’s relative success in growing alternative energy production; the subsidies that have incentivized alternative energy production are now seen as costing more than the presumed gain in self-sufficiency, as fossil-fueled power generation is still needed as backup for fluctuating alt-energy production. The increase in domestic energy production was intended to reduce the vulnerability implicit in dependence on foreign energy providers, yet the increase in domestic energy production has not yet reached the critical threshold where vulnerability to price shocks has been significantly reduced. This highlights the critical nature of the autarchic thresholds of systemic costs and freedom of action. Above a difficult-to-define threshold, the trade-off required to increase self-sufficiency to the point of being meaningful is too high in sacrifice or cost to the economy or society; the trade-offs required aren’t worth the gain in freedom of action and self-sufficiency. Put another way: Below a difficult-to-define threshold, an increase in self-sufficiency does not yield either lower or more reliable economic costs, nor does it decrease the nation’s vulnerability to blackmail, price shocks, etc. In other words, though dependence always has potentially negative consequences, it can also be cheaper, more convenient, and more profitable than autarky. The diffused benefits of autarky are often overshadowed by the presumed burdens of increasing self-sufficiency. But this trade-off can be illusory. Though the status-quo players benefiting from dependence on foreign markets, trade, and capital will shrilly claim that the nation is doomed should their foreign-derived profits be sacrificed in favor of increasing autarky, a desire for more autarky often pushes the economy and society into a highly positive and productive search for greater efficiencies and more productive uses of capital. Is the sacrifice needed to reach self-sufficiency as steep as presumed, or is a new order of efficiency enough to meaningfully reduce dependence on foreign resources and capital? If we look at America’s consumption of fossil fuels and its dependence on oil imports to feed its consumption, autarky forces us to ask: Exactly how difficult would it be to lower consumption enough to eliminate the need for imported oil? Would the economy suffer a death-blow if vehicle, heating, and appliance-efficiency standards were raised, and business travel declined in favor of telecommuting and teleconferencing, etc.? 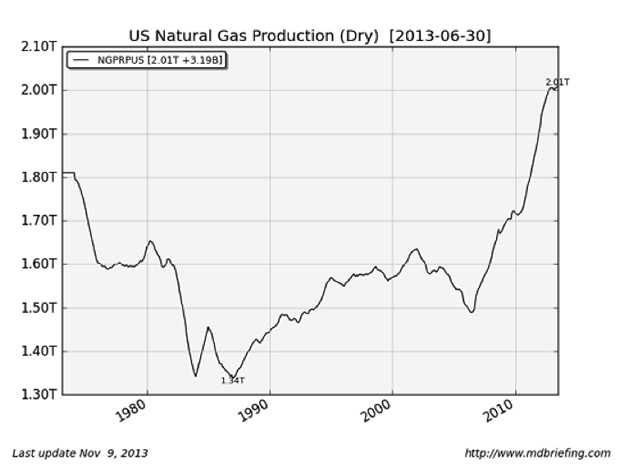 The answer of those profiting from the status quo is, of course, “Yes, the U.S. will be fatally harmed if energy consumption declines,” but the reality is that such creative destruction of wasteful inefficiencies and consumption is the heart of free enterprise and the rising productivity that creates widespread prosperity. If the U.S. had listened to the 1970s-era defenders-of-the-status-quo doomsdayers, who claimed that environmental codes and higher energy-efficiency standards would doom the nation, the U.S. economy would in fact be doomed by the absurdly inefficient energy consumption of that era. The U.S. economy has remained vibrant and productive precisely because the defenders-of-the-status-quo doomsdayers lost the political conflict between the forces of improved efficiency and productivity and the defenders of the inefficient, wasteful, and diminishing-returns status quo. There is one other element in the calculus of dependence, vulnerability, and freedom of action implicit in any discussion of autarky. 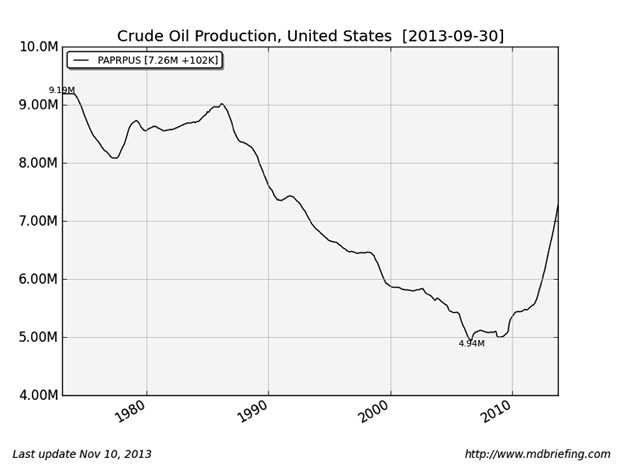 Despite the rapid increase in production of oil and gas in the U.S., America remains dependent on imports of oil. But not all foreign sources of oil, capital, expertise, etc. are equal; some suppliers may be stable, close allies, and share borders and standards of trade (for example: Canada, Mexico, and the U.S.), while others may be distant, unstable, and unreliable. In other words, autarky may not be worth the cost if a nation is dependent on stable, close neighbors, but the value of autarky rises very quickly when a nation’s survival is dependent on distant, unstable nations with few ties other than the profitable export of resources. 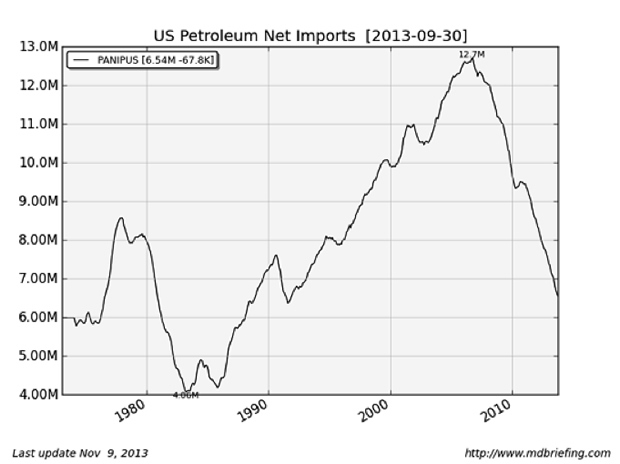 Though a survey of America’s relative dependence and self-sufficiency would require a book, let’s look at a few charts to get a taste of America’s declining dependence on foreign-supplied oil. Declines in consumption have the same effect in terms of reducing dependency as do increases in domestic production. 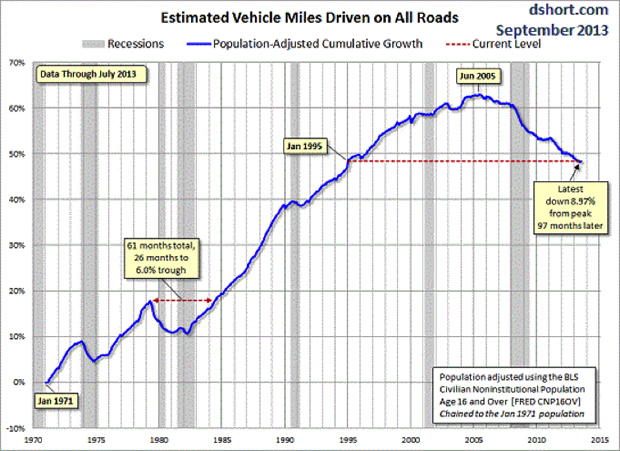 Has the U.S. economy imploded as miles driven have declined? Or has the increased efficiency this implies boosted productivity? There are many issues raised by these charts, including the sustainability of increased production, the possibility of further declines in consumption, policies that affect production and consumption, and so on, but similar charts of grain, capital, expertise, goods, etc. would help to fill out the complex set of issues raised by declining consumption and increasing domestic production and productivity. In finance, dependence can mean dependence on other nations for capital and/or profits. What is the consequence of rising autarky for an economy such as America’s that is heavily dependent on foreign markets and trade for the stupendous profitability of its corporations? In Part II: The Consequences of American Autarky, we will discuss this and other ramifications of America’s rising autarky. America’s ability to project power and maintain its freedom of action both presume a network of diplomatic, military, and economic alliances and trading relationships which have (not coincidentally) fueled American corporation’s unprecedented profits. The recent past has created an assumption that the U.S. can only prosper if it imports oil, goods, and services on a vast scale. Could the U.S. shift production from overseas to domestic suppliers, and reduce its consumption of oil and other resources imported from other nations?